The Maserati Company (Società Anonima Officine Alfieri Maserati) was set up in Bologna on the 14th of December, 1914. The brand name is the surname of the founder, Alfieri Maserati, as well as of his numerous brothers, almost all of them were involved in the company’s activity. During the creation of their trident, the Maserati brothers received inspiration from the statue of Neptune, which is located in the central part of Bologna, where the company has its headquarters. The trident with the signature Maserati under it was drawn by the artist Mario, who was also one of the seven Maserati brothers, who was never occupied by the design or production of vehicles. The statue of the sea king Neptune inspired him, or rather his weapon, this is the work of the known Florentine sculptor Giovanni da Bologna, who also had a nickname Dzhiambolonya. But the idea of the trident itself has quite another story. The trident is the pitchfork, which once saved Alfieri from the death. During his walk in forest, a wrathy wolf attacked him, but an ordinary man in an overall with a pitchfork in hands came pat and saved the founding father of the Maserati brand from, as they say, the certain death. Alfieri, in his turn, did not leave the favor unanswered and made the man a racer of his team. There is also a version that the trident means three brothers who stood at the origins of the company – Alfieri, Ettore, and Ernesto, but this is just a modestly beautiful symbolism. The Maserati cars were, in essence, the only ones, which at that time could give a challenge in a racecourse to cars of German carmaker Mercedes. Now, as many years ago, the Maserati logo features the red trident on a white background, under which the name of the brand in a blue background is written in the company typeface. 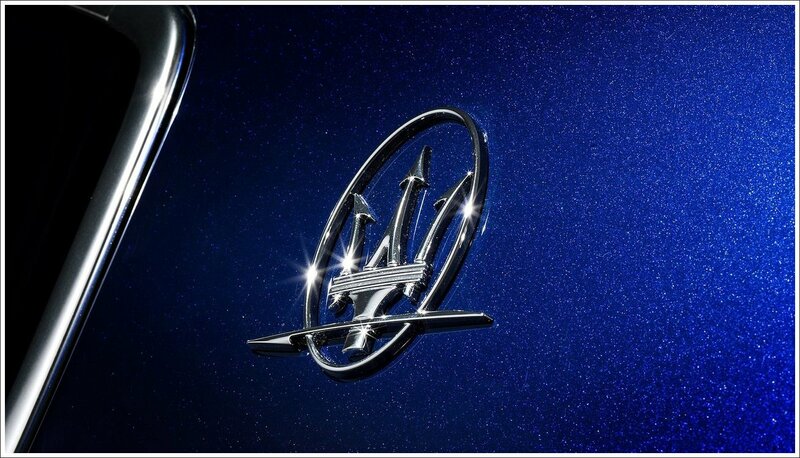 The blue color of the Maserati logo signifies its power, excellence, and class. The white color features purity and charm of the car brand. 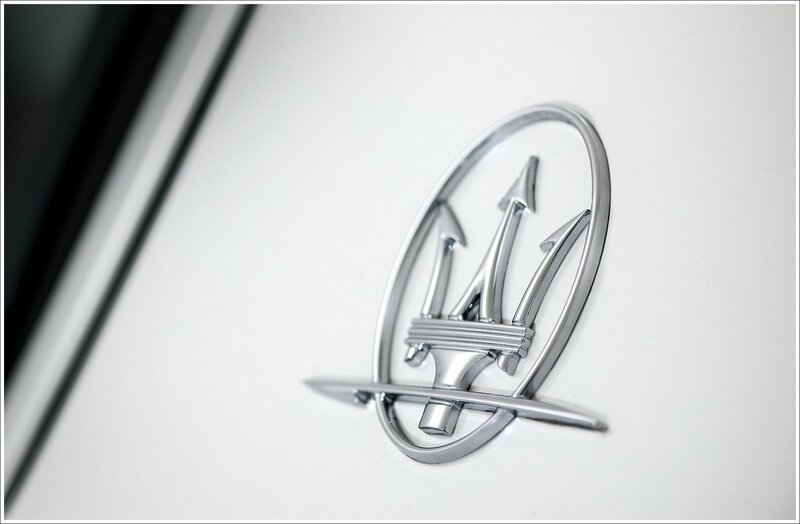 It is curious that the 25th of April, 1926 is assumed as the recognized birth date, since which the history of the make with the Maserati emblem is dated. This day, the Alfieri car came in an easy first at the Targa Florio competition. Since 2005, Alfa Romeo, which belongs to FIAT Group, became the owner of the Maserati make. What is there in the make`s plans? In 2016, a sports car, the coupe Alfieri is expected. The sports coupe is assumed to be offered in two versions: the rear wheel drive + V6 with 410 hp and a four-wheel drive version of 450 or 520 hp. The convertible is expected to complement the line as well in 2017. And the futuristic concept car, which is also a sports car, Maserati GT Garbin, can be called the car of the make future. It is correlated with 2020. The complete rethinking of the auto exterior is shown here. But the traditions are retained. Designer elements not only of cars but also of Armani clothes and even of Spanish operas are used in the auto design. The car is fitted with the V12 engine. The blue emitting diode lights that are complementing the design are installed in several points of the car. And the special mechanism of the car door opening does not require the additional space in a parking; one can get into the car even in a very narrow place.